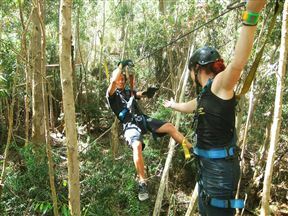 Hermanus Forest Adventures offers keen visitors an enjoyable zip line above the ground. 2 guides will help you glide platform to platform, 8 to 10 meters above ground, surrounded only by natural wildlife and nature. The are about 9 to 12 platforms, and slides range from 30 to 120 meters. You'll get to control your speed, so you may enjoy a nice steady speed, or a fast adrenalin zip line adventure if you are inclined. Hermanus Forest Adventures Tree Zip Lines is 3.6km from the centre of Hermanus , the nearest airport 83.6km (Cape Town International Airport).